There has been an increase in coyote activity in and around our community, perhaps as the result of loss of habitat to the development of University District. There is a coyote den in the wooded area at the corner of Collegiate Road and 24th Ave. Some residents have noted aggressive behaviours in the recent months. This is concerning to walkers, off-leash dogs, and outdoor cats. Although coyotes will always be seen in the area, it has led some people to avoid walking in the area in late evening or at night, or in the early morning hours. A notice near the fence around the forested area suggests people should contact Alberta Fish & Wildlife (403- 297-7789) or University of Calgary Customer Care (403-220-7555) if they have concerns. In the case of our community it is important that any aggressive coyote encounter in the last year, or in the future, should be reported to these sources, if possible with a dated written record, so that incidents can be documented to help find a solution to the problem, and the scale of the problem is known. Many people believe coyotes are harmless. 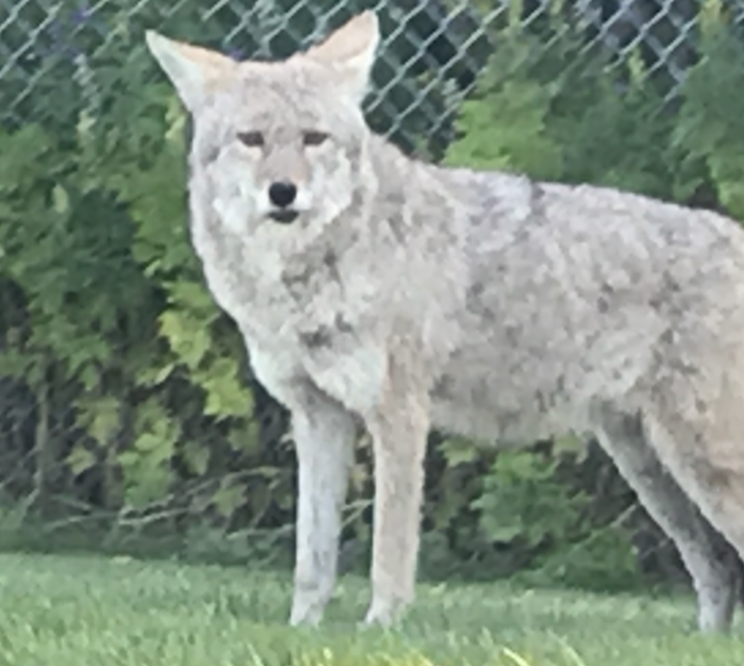 Others, including one councillor, believe it is time the city does not simply provide advice about what to do when encountering coyotes, or fence off park areas if there has been a coyote problem. They suggest the city should have a more active policy towards coyotes, as seen in Edmonton. See the article on “Growing Coyote Problem” in Calgary Herald, June 18. In our area, some residents have raised concerns about the proximity of the coyote den to Alberta Children’s Hospital, Child Development Centre, the University Daycare, Ronald McDonald House, and the associated agencies that have large numbers of children passing through or in playgrounds. Coyote seen on the edge of the University grounds by University Heights. Picture taken in September near den on the Collegiate Road cut-through. How can I help to reduce or avoid problems with coyotes? Don’t approach or feed coyotes. Secure open areas under porches, decks or steps. Clean up your compost, garbage and other potential food sources. Don’t store food outside. Clean up around bird feeders. Clean up fallen fruit. Keep pets on a leash, in your enclosed property, or inside your home, especially at night. What should I do if a coyote approaches or acts aggressive? Try to scare the animal by shouting and waving yourarms overhead. Bang sticks or clang pots together towards the animal. Maintain eye contact with the animal & back awayslowly. What else can I do to avoid a negative encounter? Never leave small children unattended. Never approach wildlife and teach your children not to either. Carry a shrill whistle or portable alarm with you inareas frequented by coyotes. Never feed coyotes or leave pet food (including birdseed) outdoors. Clean up all loose garbage and put it in approvedwaste receptacles with the lids on. Keep dogs on a leash – even in off-leash areas and especially in areas where coyotes are known to frequent. Coyotes can be attracted to an area by dog faeces, so please clean up after your pets, even in natural environment parks. Cat owners should keep their pets inside their homes.